Are developers really making too much? LATELY, there have been many ongoing discussions on the topic of high property prices. It made me ponder on the various causes that might have contributed to the situation, including the question of whether developers are making too much. As I took a sip of tea, many thoughts came to mind which I found interesting and worth sharing before we dwell further into the real factors of rising property prices. Based on annual reports (see chart) of three major property developers in Malaysia, namely SP Setia, UEM Land Holdings and Mah Sing Group, they are generating an average of 18% profit margin from their projects, and at the same time incurring a staff cost of about 7% of their total revenue. These companies are major developers in mass residential properties which have high sales turnover, and therefore a good reflection of the average developers' profit margin in the residential market. These findings may contrast with people's perception of the profitability of the property development industry. Though it may sound like a fantasy, assuming I could convince these three property developers to give back their entire profit to their customers, it would mean an average of 18% discount on property prices for the year in question. This would seem like a fantastic bonanza for the buyers of the properties in question. But would a 18% discount really make these properties affordable? I would imagine that people will still find these properties expensive. Let's take an example of a terrace house that costs RM700,000 in Petaling Jaya. It would be priced at RM574,000 after the 18% discount. If a home buyer is able to secure a 90% loan with a maximum repayment period of 30 years, the monthly loan instalment for RM700,000 and RM574,000 would be RM3,081 and RM2,526 respectively (based on a BLR-2.4% loan package with current BLR at 6.6% per annum). From the above example, while the discount may seem substantial at absolute price, it is not significant in terms of monthly loan instalment for home buyers. The debt commitment level for the latter is still considered high and out of reach for most people especially those who have just started their career. Now, let's take a hypothetical scenario that the property developers decide to make their staff work for free that year. It would mean another 7% discount to customers after deducting staff cost. Even with this total discount of 25%, property prices in many areas would still be considered unaffordable to many. Anyhow, back to reality, it is impossible for any commercial enterprise to work for free or give up its profit if it was to run a sustainable business, as well as to satisfy its shareholders' expectations. For the property development industry which has a product life cycle of four to six years (starting from land acquisition to handover of keys to customers), it is a challenge to further compress the profit margin after taking into account the risk and inflationary factors involved in such a long product life cycle. Let us look at other industries as a comparison and review their profit margins. For the banking industry, the three largest local banks that were selected are Maybank, CIMB and Public Bank. Likewise, the three major players from the mobile telecommunication services were Axiata, Maxis and Digi. 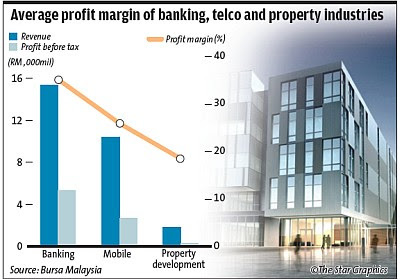 Compared with the average profit margin of the banking and telecommunication industries, the profit margins of property development companies are significantly lower and definitely not on par in terms of the actual profit before tax figures. Putting aside the profit margin for property development which is already relatively low compared with the other two industries, what are the other factors that are causing high property prices? Many other underlying factors could be looked into in relation to the escalating property prices, instead of merely contemplating the issue as a market trend or as a result of developers' profits. The Government, property developers, home buyers, as well as NGOs (non-government organisations) will need to work together to identify the root causes of inadequate supply of affordable homes in Malaysia. Let's ponder this issue over the next few weeks and I welcome any suggestions and feedback to shed some light on it as I dwell further into this crucial topic in my next article. FIABCI Asia-Pacific chairman Datuk Alan Tong has over 50 years of experience in property development. He is also the group chairman of Bukit Kiara Properties. For feedback, please email feedback@fiabci-asiapacific.com. What the Tun Razak Exchange could look like. A BIG pipeline of commercial properties in and around the city centre itching to be launched over the next decade or so is stoking concerns by the day – will there be sufficient demand for all these buildings? 1Malaysia Development Bhd, the master developer of the massive RM26bil Tun Razak Exchange development is fully aware of such concerns. Close to half of the TRX real estate project will comprise office buildings. The project comes along at a time when many other mammoth commercial projects such as the re-development of 926ha Rubber Research Institute (RRI) Malaysia land in Sungai Buloh and Permodalan Nasional Bhd’s proposed 100-storey Menara Warisan Merdeka are poised to take off. Naturally, the question of oversupply is posed to the government agency. “The easy answer to such concerns is... that our interest is aligned towards making sure that there is not going to be an oversupply,” says 1MDB chief executive officer Datuk Shahrol Halmi. “As a government agency, 1MDB is cognisant of the impression that... look, we are the Government, a 800-pound gorilla, therefore we can squeeze people (private developers) out,” he says, referring to the fact that the agency is spearheading such a big project in one of the city centre’s prime areas. “But I ask you... is it the Government’s job to go and regulate the area of square footage that is available in the market – is that a good idea? Is it then fair to say if there is better quality that is available on a certain side then that would be our chosen place?” he asks. “The reality is that it is not the Government’s interest to destroy the economy of the city,” Shahrol says. How then do we address concerns of oversupply? “Via market researches, do studies on commercial property demand, moving forward – let market economics dictate,” he says. As it is now, there is already an oversupply of commercial properties in and around the city centre, according to Henry Butcher Malaysia director Lim Eng Chong. And the figures seem to back that premise up. International property consultant VPC director and chartered surveyor James Wong says the take-up rate for office buildings which are being built and will be completed this year stands at below 50%. “This is for commercial properties in and around the city, but the same scenario exists further away from KL, such as in Cyberjaya; there is already an oversupply situation,” Wong says. However, the market will tend to correct itself in time to come, he adds. David Jarnell, senior vice-president and head of research at Malaysia’s Jones Lang Wootton writes in a recent report that this year alone, the prime office market in the city centre is expected to increase by 2.04 million sq ft with the delivery of several prime office buildings. “The average occupancy rate in KL city centre declined from 84.9% in the fourth quarter 2011 to 81.3% in first quarter this year as the newly completed offices did not yet register any physical occupation,” he writes in his report from which an extract was published in StarBizWeek in June. Jarnell further notes in his report that in the first quarter this year, the average net rental reduced marginally as many landlords were still maintaining the same rental rates. Despite all of this, Henry Butcher’s Lim points out there is a saving grace. The fact that the Government is pushing for so many economic projects as part of its larger plan to drive the country towards higher productivity and income will help attract foreign direct investments (FDIs) and congregate talents and innovators in the country. This will inevitably produce demand for not only commercial properties but also other property types. “The financial and economic reforms, if carried out properly, will get the intended results,” Lim says. “The TRX project is exciting, but more than real-estate, the entire economic reform idea is a progressive one – if it is realised well, it will gel well with mega projects such as the TRX,” Lim says. VPC’s Wong points out that in order to create effective demand for commercial properties, the country needs FDIs which will bring in the multinational corporations. In this regard, mega projects like the TRX are needed, but with a twist. “We need the FDIs to come but before that we need mega developments like the TRX, but with mega developments come the risk of depleting demand,” Wong says. 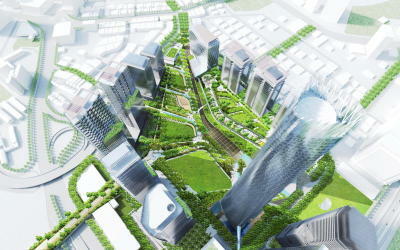 Artist impression of Tun Razak Exchange in Kuala Lumpur. 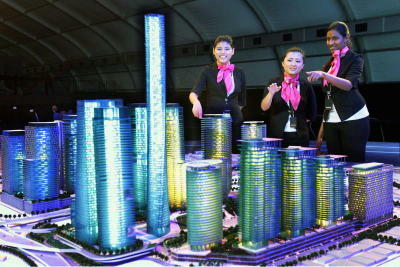 1MDB will spare no effort in building the state-of-the-art Tun Razak Exchange. UNLIKE other ground-breaking ceremonies where VIPs often sweat it out in the blazing sun with a shovel in their hand to mark the occasion, the one for Kuala Lumpur's newest and arguably swankiest financial district was done in style and comfort. In one late July afternoon near Jalan Tun Razak, the VVIP who got the project officially off was Prime Minister Datuk Seri Najib Tun Razak. What he did was just touch a LED sphere that rose right before him in a makeshift air-conditioned hall and within seconds, images of a huge excavator loading gravel onto a lorry appeared on two large screens. That was it. No heat, no sweat, just a simple ceremony to mark the momentous occasion, and powered by technology. And it will be smart technology, a digital backbone, eco-friendly elements and a garden city that will be the hallmarks of a futuristic city for modern living and working. When the cement and paint dries, the Tun Razak Exchange (TRX) will mould and alter the increasingly towering skyline of Kuala Lumpur. Named after the prime minister's father (Tun Razak), TRX will house 26 buildings over a 70-acre site on the fringes of the Kuala Lumpur city centre. It is designed to house hundreds of multinational companies, financial institutions, government agencies, hotels and support services. The project has an eye-popping gross development value of RM26bil. Though a lot of planning has gone into the design of the new district, the question is will it be enough to thrust KL into one of the top 20 livable cities in the world? Will it be a financial hub that can attract the big deals and talent that seems to gravitate to Singapore and Hong Kong? Would its emergence create a glut in the real estate sector? And what will it take to turn this whole dream into reality? The detractors are already in full voice. They are so sure this new futuristic city will become another “white elephant.” But its master developer, 1Malaysia Development Bhd (1MDB), is convinced otherwise. It's sure that TRX will not just change how real estate is developed in the city and inevitably raise the standards of future developments, but it will become an oasis for global companies to reside and an area for talent creation. Encapsulating all of that, it will be a place where enough and sustainable economic activity will be created. “People are willing to bear the high cost of living in London because it has everything, from being a financial hub to the connectivity, shopping, gourmet, the art galleries... we want to strive for that. “We are like a part of this one big jigsaw puzzle and TRX can only address the overall vision of the Government when the other pieces are also moving. The reality is that it requires a lot of effort,” 1MDB chief executive officer Datuk Shahrol Halmi says. To make sure this new district had all the trappings of a futuristic and livable city, the team visited places such as Rappongi in Japan, Hong Kong, Marina Bay in Singapore and Canary Whaft in London to extract the best of what those places have to offer. But he is tight-lipped about the name of the investor. Those in the know say it is the Abu Dhabi government via Mubadala Development Company that is the key strategic investor. It is no coincidence that Mubadala had in October 2010 forged a collaboration with 1MDB with a view to explore joint key strategic projects in the Kuala Lumpur International Financial District or KLIFD, now known as TRX. Shahrol admits KLIFD was a “mouthful” to pronounce and tricky to remember, hence the name change. The Abu Dhabi investor will bring RM3.5bil worth of FDI for the first phase of the TRX development, which will encompass three buildings on top of a mall plus the infrastructure. The first phase should be completed in 2016 and TRX is 15 year project. There is interest to fund the entire infrastructure cost of TRX and both parties are locked in talks. If all parties are agreeable, the Abu Dhabi investors will bring in an additional RM2bil to fund the infrastructure work, which will bring the total FDI from them to RM5.5bil. And that puts TRX in a good spot, says an observer. “It is that kind of momentum that can push this huge project through but we also need more strategic investors as this is a huge development,” he adds. Shahrol did say 1MDB plans to lock in another strategic investor soon but did not elaborate. “We have enquires from all over the world, from investors, potential tenants, service providers and even technology firms (that want to be part of the development),'' he says. Special advisor to the Japanese Cabinet Tadashi Maeda, who was at the launch on July 30, says he had written to the Malaysian government to express the interest of investors from his country to get involved in the development of TRX. “The Japanese are definitely interested as they feel they have the technology to aid TRX,” says Shahrol. “It is not a Middle Eastern and Japan play. There have been enquiries are from all over and there may be some government to government arrangements. Even some of the local players are keen to be party to this development,” says someone familiar with the mammoth project. TRX will be developed in plots and indications are that it will be spread over four phases. But that will depend on how 1MDB wants its dream realised. “We expect to have strategic investors where they will develop (some buildings) with us and there will be plot by plot joint ventures and also outright sale of land,” he says. To Shahrol, it is about getting the momentum moving and then it can shift its focus and pitch towards its next priority. Local players will be part of the development including local construction companies, but a key component will be about raising the standards and quality to that of a world-class development in order to attract tenants. But he is not about to let anything stop TRX from being a reality and he has a checklist of what needs to be done to make sure there is total cooperation and coordination in delivery. The concept of working with key strategic investors is similar to that deployed by Iskandar Malaysia and other corridors throughout the country. All dangle incentives to get the FDIs and it is no different for TRX. In fact, a task force has been set up to ensure no stone is left unturned in the planning and development of TRX. That has raised concerns in the market place if the other corridor developments have a fleeting chance of getting more FDIs if TRX is going to be a magnet of interest from investors. He says Iskandar's strength is that it is near Singapore, the Northern corridor's strength encompasses agriculture, while the Eastern corridor is more into oil and gas and support services. “Why should Petronas suddenly scale back from the Eastern corridor (just because TRX has emerged) when they (are so entrenched in) Kertih, or why should Sime Darby scale back from the Northern corridor? “Investors have their own reasons as to why they are investing in the corridors. They have their own sectors and strengths and each of the corridors have their own attraction and appeal,” he adds. TRX is seen as an enabler and catalyst of the Government's Vision 2020 and the ETP initiative. It is supposed to spur new areas of growth, facilitate economic transformation and promote regional as well a global prosperity. The idea is also to create enough economic activities to create and aggregate talent and move towards a sustainable model for green initiatives. TRX is supposed to pioneer all of that, hence some of the incentives. The incentives on offer include 100% income tax exemption for 10 years, stamp duty exemption on loan/service agreements, incentives for industrial building allowance and accelerated capital allowance and income tax exemption of 70% for five years for eligible property developers. Shahrol does not believe there will be an oversupply of commercial buildings once TRX is built. He also does not subscribe to the notion that there will be a flight of quality tenants to TRX. TRX is three minutes away from the Petronas Twin Towers and the Bukit Bintang tourist belt and a stone's throw away from the central business district in Jalan Sultan Ismail and Jalan Raja Chulan. TRX, however, will share some of the features of those places but will differentiate itself from comparable business districts within Kuala Lumpur. It will have open spaces and parks to create a garden-like city. Of the 70 acres, 21 acres are for parks and open spaces. As for the buildings, there will be 26, one of which is the signature tower with 200,000 sq m of floor space. Combined with the other towers, TRX will have nearly 900,000 sq m to offer when fully competed besides service apartments, hotels, conference and retail facilities and a cultural centre. Shahrol says: “We are not planning to go through the list of who is on that street and try to get them to TRX. We are more interested in who are the new players that we can entice, companies and businesses which will have otherwise set up regional centres in Hong Kong or Singapore. “Of course, over time there is going to be a flight of quality tenants, but it will be a question of location where it makes business sense for them to move to TRX because of all there businesses there. This flight would also inevitably force the rest of KL to upgrade their services and we will be seen as raising the bar for real estate development for other parts of KL and elsewhere and that will eventually be good for the country,” he says. He adds that “cannibalisation effect will be mitigated” and that in itself sets new standards in real estate and it is all these factors that can help push KL to be among the top 20 liveable cities. “It is also a willingness issue on the part of property developments to push for higher standards so that there is no flight of tenants. If you do not adapt and change with the times then tenants will just move to places that offer better value,” adds an observer. Kuala Lumpur has long fought a losing battle to be recognised as a financial hub in the region. It pales in comparison with financial centres such as Singapore and Hong Kong. But can TRX change the game? “It would be tough given that some of the big deals are done in Singapore and, the republic and Hong Kong are recognised internationally as financial centres of this region,” says an observer. But KL has the trump card when it comes to Islamic banking. It has received global recognition as a hub for Islamic Banking. Islamic finance was worth just US$5bil (RM15.6bil) in 1985 and now it worth US$1 trillion (RM3.12 trillion) and the Malaysia's Islamic finance sector is already worth US$400bil (RM1.25 trillion) and the booming sector is set to triple in value in the coming decade, says a report. “How do we compete? Well, you start with the first step, figure out what are the things that we need to do, which is infrastructure. And the Government is also looking to ease the way of doing business here. To say all the big deals are done in Singapore is not true. Just look at our recent IPOs, these deals are done here. “If you actually start doing all of this correctly, providing a good environment, and we have inherent advantages as our cost is still a lot lower, and our talent, what if we create a business here for them? “We are also not saying that we are going to compete with Singapore but what we are saying is that we want to leverage on our strengths. We have a good reputation and good momentum in Islamic finance and we just want to seize the day. The point is that it is better to do something than not do it at all,” he says. He adds that TRX will also in no way be duplicating the Labuan Offshore Financial Centre. Among the many real estate projects in the city centre, KL Sentral has been pretty lucky in getting investors and tenants because a lot of planning went into the project. It is rare to plan on such a huge canvas; something similar with what TRX will be going through. What could potentially derail such a project of this size is a host of issues. Shahrol says that in case of a slowdown “it does not make sense to push this through and it would not make logical sense to come up with a building in the middle of a recession.” That slowdown issue has been raised because of the fragile economic situation in Europe and the United States. 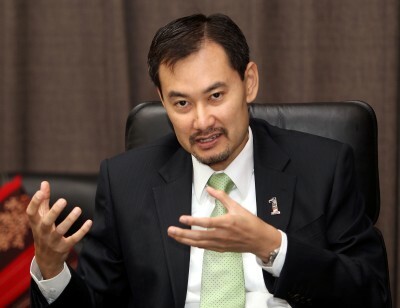 RIMBUNAN Corporate Advisory Sdn Bhd, which is tasked by the government to revive abandoned housing projects, expects to complete 15 such developments by end of 2013. Rimbunan managing principal and founder Kumar Nathan said the company expects to complete seven projects by the end of this year and another eight next year. "Although our company started in 2004, we only undertook abandoned housing projects in 2010 after we were appointed one of the 22 companies by the Ministry of Housing and Local Government to revive such projects," Kumar said in an interview with Business Times recently. "We will complete the 15 projects, valued between RM130 million and RM140 million, before taking on new ones, including commercial buildings," he added. Most of the abandoned projects were in Selangor, Johor, Penang and Kedah. "We find that the majority of the abandoned projects were undertaken by developers who were first timers in the business," said Kumar. According to the statistics provided by the government, so far this year there were 154 abandoned projects nationwide, of which 104 have been revived. Kumar said the projects were mainly within the medium-low to low-cost apartments or houses. "Usually these projects are done at a loss. "That is why most of the time these projects are often abandoned," he added. 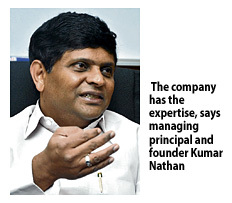 Kumar did not discount the possibility of the company undertaking its own property developments in the near future. "We have the expertise and we know how to revive abandoned projects. "We are definitely looking into property development but that will probably take place later. "Right now we have our plate full with the abandoned projects," he added. SBW: Why the name TRX from KLIFD? Over the years, we got feedback that KLIFD is bit of a mouthful to pronounce and hard to remember, so we thought it'll be good to go and find a good memorable name for the district. TRX came about because it's on Jalan Tun Razak and we are just taking the cue from Wall Street, which is named after an actual street. What's the role of the Government in TRX and why must the Government be driving it? Because the Government is driving the ETP and who else is better to catalyse this than the Government? The Government is going to start the ball rolling by doing up the master plan and setting standards. The developers will be invited to participate. What if there are no “A” grade tenants for TRX? There will be tenants if we assume the economy is going to grow based on the plans in the ETP. It's a risk I admit but the risk is higher if we do nothing as a country. We are part of the Government's machinery in pushing the country to move forward. Is there money coming from the Government to develop TRX? The land was sold to us for RM230mil the valuation at that point of time. The rules on incentives often change to attract FDIs, why? I cannot speak for the Government but I can roughly outline you the process. We, as the land owner and master developer, would want everything but it's not like whatever 1MDB wants, we get for TRX. There is a process to follow. There are a lot of discussions with the Securities Commission, Finance Ministry and Bank Negara, and it is up to the policy-makers to balance it up. What's in store for investors in TRX? There are different models we are examining, and the standard model is that I have the land, you have money and expertise, so we do a joint-venture, where you go and build and in return, I get some of what is built or I get money and you keep everything. We are still firming up things. It's not rocket science, just a matter of risk appetite. What if you partner does not deliver? That is why the choice of partners is very important. Our partners are people who are suppose to have deep pockets. They also need to have the capability and commitment to the vision and the key point here is that, which ever the party we are working with, needs to be right, and we do not go through intermediaries. Is businessman Low Taek Jho part of this project? Is he the one that helped get the commitment for the first RM3.5bil? The role of Jho Low as far as 1MDB is concerned is zero. I 've heard talks that he is advising the Government on Middle Eastern investors but it's not true. What he does is to help promote Malaysia to investors. Are we paying Jho Low anything? Nope. His role is zero, if anything he is probably just introducing a few people to the Government there. We are dealing directly with the Government agencies there. There's no intermediary. Who else has indicated interest beside the strategic investor? The Japanese are definitely interested. Once the momentum is built, hopefully we can have our pick and be in a position to open up an international tender. Have you opened up bids for construction players and companies to take part in TRX? Not yet. We want to lock in the strategic investors first because when you are a strategic investor, you also want to have a say in who will participate in the project. We expect to have a lot of value around the table. The idea is that we are definitely going to be encouraging local investors and developers, but we will balance that with the fact that we need to get FDIs and create something which is globally competitive. We will let the market drive this. The talk is that a large part of the development will be undertaken by investors from the Middle East. No, we are looking beyond the Middle East. Enquiries are coming from all over the world from investors, potential tenants, technology and service providers. IMAGINE heading towards a building in the city centre and already knowing exactly where the empty parking spaces are after merely punching some buttons on your smartphone. Then when you leave, even during peak hours, imagine yourself cruising back home, sidestepping the infamous traffic jams Kuala Lumpur is inundated with, thanks to numerous exit points. While it may seem like small comfort to some, urbanites will tell you how welcoming this development is. And it is but a teeny-weeny part of what the Tun Razak Exchange (TRX) aims to offer. 1Malaysia Development Bhd (1MDB) chief executive officer Datuk Shahrol Halmi points out that such technology along with features such as on-site sewerage treatment plants, an air-conditioned pedestrian network and district-scale energy efficient features within the RM26bil strategic real estate development project, is set to create a benchmark for other financial districts in Kuala Lumpur. 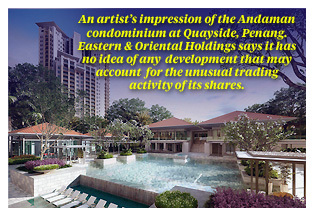 A wide range of international restaurants, cafes, cultural and business activities, amenities and a beautiful huge park for families to enjoy complete with the best of security aim to enhance the entire experience for even the most sophisticated individual, the head honcho of 1MDB, the master developer of TRX, says. And, the community within TRX is set to be made up of numerous nationalities. While detractors will argue that all this sounds too good to be true and in some way the utopian picture is, Shahrol makes a point. “We think we have to start somewhere, the risks are all there, but it is better than doing nothing,” he tells StarBizWeek in an interview. At the risk of sounding like a commercial, he says, TRX is envisioned to be a district where “talent congregates and value is created”. TRX which will sit on 70 acres in Jalan Tun Razak, according to preliminary plans, will comprise office buildings (48%), residence (31%), retail (10%), hospitality (10%) and institutional (1%). A total of 26 buildings, to have green certification, are expected to sit on the site. “The message here is that we are not limiting ourselves to financial services. “We are open and receptive even to support services lawyers, accountants, anybody and everybody who can basically contribute to the vibrancy and diversity of the district,” he says. The first phase of TRX comprising a mall, apartments and a hotel, is slated to open in 2016 to coincide with the completion of the first line of the country's mass rapid transit (MRT) system. There will be four phases in total. Thus far, there has been much interest shown in TRX from investors and companies, according to Shahrol but 1MDB is awaiting discussions with strategic investors to be completed before opening up bids for projects in the district. Visits were made to famous districts globally with large expatriate communities including to Roppongi, a district in Tokyo, London's Canary Wharf, Singapore's Marina Bay Financial Centre and various financial districts in Hong Kong. “We incorporated only the best of these places because not all of their features are applicable here,” Shahrol says. “For example, when I talk about families enjoying themselves in the park, that's not so suitable in our weather. “But I told the team, we must make it happen, I was surprised to find out there is actually technology which enables rain-trees to be planted on top of our multi-level podiums... so when you are walking on top, the big trees in the park can shield you from the heat,” he says. The buildings are also expected to incorporate wind-tunnel effects, so a simple breeze will be amplified for a cooling effect, Shahrol adds. In Malaysia, TRX's closest comparisons would probably be the financial areas of Jalan Sultan Ismail and Jalan Raja Chulan, says Shahrol but he stresses that 1MDB is not planning to pinch companies which are already located at these locations and get them to re-locate to TRX. “It's more of who are the new players that we can entice those who would have otherwise set up their regional centres in Hong Kong or Singapore. “Over time, the aspiration is that there's going to be a flight of quality where by then it would make so much business sense for companies to move to TRX because of all the business there. “That will force the rest of KL to upgrade their services... remember this is a long-term plan,” he says. EPF’s wholly-owned unit Kwasa Land now owns the RRI land in Sungei Buloh. As a person who was born and spent his childhood years in the Rubber Research Institute of Malaysia (RRI), Sungei Buloh, it is with some nostalgia that I read about plans to develop the area. That piece of land now straddling a bustling area near Kota Damansara, Subang Airport and the rapidly developing area of Subang, houses the RRI's research facilities and rubber estates. For those who lived there a long time ago, it was a tranquil and idyllic area with swimming and paddling in the streams, sports of all sorts in the evenings, hunting, biking and excursions into the jungle nearby. Tigers were said to have been sighted and someone even shot a leopard once. But the area around it is virtually unrecognisable now and the RRI land stands like an oasis in a desert of poorly planned development. But it will fall to development too as the land has been sold, reported for RM2bil to the Employees Provident Fund (EPF). RRI will get to retain 216ha for its research facilities. EPF's wholly-owned subsidiary Kwasa Land Sdn Bhd will undertake a master plan of the entire area, the area for development will be split up into smaller parcels and the private sector will be invited to tender for their development. There are plans to have an MRT station too in the area and the whole development is expected to take 10 to 15 years. No doubt, EPF was chosen by the Government to get the RRI land because it is a provident fund whose members comprise most of the workers in the country and it would therefore be seen as a more neutral and independent party to develop the land. It is necessary that it gets expertise to both produce the master plan as well as to see how it can maximise the value of the land for itself. Land scarcity in the Kuala Lumpur/Klang Valley area means the people will be closely watching the former RRI land, possibly among the largest available so close to KL city, to see who gets what. In fact the jostling seems to have already started. It was reported that listed Dijaya Corp was in talks with top officials of EPF on developing some parcels there. This was promptly denied by Kwasa Land. Dijaya has declined comment but continued to express its interest in developing some parcels of the land, dangling as a carrot an access road which can be built on its own land that it says will link the RRI land to Petaling Jaya. In future, more are likely to stake their claims and make their cases for why they should be chosen over others. EPF and Kwasa should come up with a master plan. This is not something that can be done in a month or two and even if it is finalised there should be provisions to accommodate changes in future demand. That requires technical expertise. What can be done is to have an international tender process to invite property players to come up with the best master plan and choose one. It will mean input from some of the best brains in the world in the area would have been tapped. Next would be to get the best local construction companies involved not necessarily developers. They can then build the projects according to the exact specifications set by EPF and EPF will have complete control of the development at all times. Completion schedules need not be left to the mercy of developers who might finish their projects at different times. Importantly, it also means that EPF would be able to maximise the returns from the development of the land instead of sharing it with other developers. If whole parcels of land are sold to other developers, then it is highly likely that the entire project will not be properly integrated and there will be a mishmash of different looking structures with no continuity or theme through out the entire development. On the flip side, that would mean that EPF would have to take on plenty of close management, tough but not impossible with the right staff and the right consultants. But above all what is needed is honesty, competence, integrity and transparency in all the efforts to do something good with this massive piece of land. That means instituting the right processes from the start open tenders, picking the best to do the job, etc. EPF through Kwasa must maximise the use of this land it must come up with an overall master plan which combines all elements of a good development, execute well to give a project that satisfies customers while at the same time bringing it good returns. P Gunasegaram (t.p.guna@gmail.com) plans to visit the RRI land again before it is forever changed. President of Reapfield Properties David Ong (left) and Kho have come together to share over four decades of experience knowledge in a priceless tell-all guide. 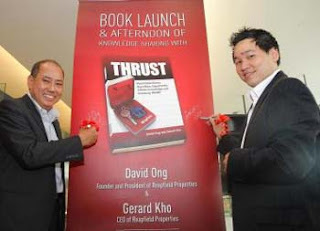 Reapfield CEO Gerard Kho answers questions about the evolution of Malaysia's real estate sector and his book Thrust Real Estate Riches which he co-authored with founder and president David Ong. This e-mail interview was done in conjunction with BookFest@Malaysia 2012. Star Publications (M) Bhd is a media partner. 1. What prompted you to write Thrust - Real Estate Riches and how long did you take to complete it? We initially took on this writing project as part of a branding exercise but within writing about 10 pages of the book, we got bored with the contents and decided to change direction to one where we made a choice to tell the industry and our customers what Reapfield was doing and has done in the last 28 years to arrive where we are today, but more importantly what we are doing to ensure that we constantly remained competitive. We have shared in this book as much as we could what we did as an organisation. There are lots of practical information anyone running a real estate agency can adopt. Many of the principles about how to grow a business profitably while adding value to people's lives are also inspiring. The book took us 15 months to complete. 2. There are so many books on properties in Malaysia today by investors and those involved in the property sector. How different is your book from the rest? We write not from the angle that we know all there is to know in the sector, or that we are the best in the industry. We don't provide the fish but we teach people how to fish. We have shared all the “secrets” we use in our organisation to the point that we are a real open book. By sharing everything we know, we walk the talk. Second, we are now forced to find new and innovative ways to run our business so that we are able to share more in our next book. 3. What was the most challenging part of writing Thrust? The most challenging part was keeping to the timeframe to complete the book and at the same time to be succinct about what we wanted to share. There is a lot more we could have shared but we were limited by time because we wanted to get it published. 4. How have the many years living in Australia shaped the book? It has helped me see that the real estate business is the same everywhere. Real estate business is never about the property. It is about the people whom we serve. People are all the same everywhere. At the fundamental level, they want to be served something of value and in return for that value, they will reward you with a well deserved “fee.” The thing many of us have done wrong in the past is to focus on sales, sales and more sales. In our pursuit of sales, we have forgotten about people. If we place people first, be it our customers, our own agents, our fellow colleagues in the real estate industry and the industry partners we work with, we will surely be one step closer to creating followers for life. Be it Australia, Singapore, Malaysia or the United States, the real estate industry is all about the people first. The property just happened to be the item of exchange. 5. How has it shaped your views as a real estate professional now that you are back in Malaysia and leading one of the largest real estate company with about 800 negotiators? People come first. It is not about being number one in the industry. It is about building our people and agents, to be the best, the most productive, to have the highest standard possible and to have ethics. Only then will they be able to service the customers. The market will continue to evolve and all of us in the profession will need to be humble enough to grow and to learn, to unlearn and relearn constantly. Only when we adopt this attitude can we succeed. There is a huge opportunity for Malaysians to train and nurture the best real estate agents in the world because of the nature and diversity of our people. 6. How different is the Malaysian property sector compared with Australia's? The pace of real estate transactions is a lot faster here in Malaysia. People are more willing to learn and less sceptical of new ideas. Though there are many areas we can improve, it is more exciting to be in Malaysia because there are still so many opportunities for the real estate market to grow and for the real estate industry to develop. We are probably what Australia was 10 years ago or so. Look at the number of cranes, the amount of construction and the way people buy and sell properties. The pace signals the optimism. Despite the inefficiencies in any country and system, there is opportunity for growth. It is terribly exciting to be in Malaysia right now as it is just only beginning to boom! We are on the threshold of being a developed nation status! I wouldn't want to be in any other place but a developing nation. 7. How do you see the property sector for the next six months of this year, and in 2013? The next 6 months may see (the price of) properties in the key areas in Klang Valley moving upwards as the number of properties available for sale continue to fall. These are properties that are priced correctly by motivated sellers. We have noticed increasingly that the asking price of properties are on the rise while the number of listings continue to decline. This will create an upward pressure on prices. Agents in the last three months are finding it difficult to get listings that are sellable. Buyers are willing to purchase properties that are priced correctly In the short term, prices are expected to increase, or at worst, remain stable. There is much optimism. The transaction numbers are less this year compared with same time period last year. This is due to properties not being priced correctly. We have experienced earlier this year a decreased volume of properties transacted, but an increase in the total value transacted. This is attributed to the fact that property prices have increased in that period compared with same period last year. 8. When did you return to Malaysia and what prompted you to make this move? I returned to Malaysia four years ago. I was offered to help grow the Reapfield group, to streamline the organisation and to bring out the best of it. It was a real challenge for me but it was a great opportunity. Since then, we have almost doubled the fees collected and the number of negotiators. 9. Are there plans for a second book? Yes, there will be. Writing a book brought clarity to the leaders in Reapfield. It gave us focus. It also allowed us to share with the industry the inner workings of our organisation. Sharing our experiences was one way we could contribute back to the industry in a productive manner. Our wish is for more people in the real estate industry to be more profitable and to build organisations and businesses that last beyond the leader's time. This is part of our succession planning and we want to help more businesses to give priority to this area. 10. As a real estate professional, what, in your opinion are the three most important things a property purchaser should consider besides location in today's fluid and volatile market? ● Get to know as many real estate agents as possible. They can profit you in your journey in property investment. Kho will be present at the BookFest@Malaysia on Aug 18 between 3pm and 3.45pm. The launch will be held from Aug 18-26 (10am-10pm) at the Kuala Lumpur Convention Centre. Admission is with purchase of the BookFest catalogue, at RM2.50 per entry or RM10 for multiple entries over the nine days. Catalogues are available at all Popular and Harris bookstore outlets nationwide and at the BookFest entrance. Entrance is free for students who are 18 years old and below and for senior citizens aged 60 and above. For more information, visit bookfestmalaysia.com. 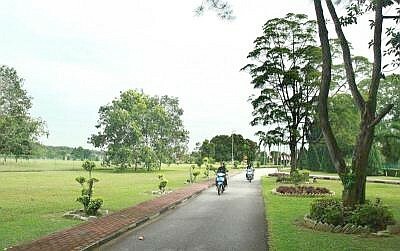 PETALING JAYA: Dijaya Corp Bhd managing director Datuk Tong Kien Onn said it would be natural for Dijaya Corp to want to participate in tendering for parts of the Rubber Research Institute of Malaysia's (RRIM) land in Sungai Buloh as its Tropicana Golf and Country Club wraps around the RRIM land. “We wrap around a major part of their land. There are many strategic advantages and synergies to be derived. “In terms of accessibility and pricing point, it would make a lot of sense to develop next to an established development,” said Tong. StarBizWeek reported last week that the EPF and Dijaya were in talks to jointly develop certain parcels of the land in Sungai Buloh. EPF subsidiary Kwasa Land Sdn Bhd, had on Monday refuted the report saying that no developers had been selected as partners for the RRIM development yet. Kwasa is the master developer. The RRIM land, which begins from the Sungai Buloh My Rapid Transit depot in the north and ends with its southern portion bordering the Tropicana Golf and Country Resort, belongs to Dijaya. It is learnt that Kwasa would be calling for bids for the RRIM land in Sungai Buloh by year-end. Meanwhile, shareholders gave their approval to Dijaya's proposed amalgation exercise to streamline and rationalise the majority of the lands and properties held privately by Dijaya's chief executive officer Tan Sri Danny Tan for RM943mil. The deal will see Dijaya acquiring some 73 properties comprising 49 parcels of lands and 16 buildings, valued at some RM1.1bil into Dijaya, giving it market capitalisation of at least RM1bil and thus making it one of the top 10 largest property developers in the country. This exercise is expected to be completed by the fourth quarter of this year. “The exercise will see Dijaya getting rental income of RM42.7mil or a yield of 8% per year, whichever is higher, over the next nine years,” said Tong. Meanwhile, the new land for development injected into Dijaya amounts to RM6.1bil. Dijaya executive director Koong Wai Seng said that the development order for some RM2bil of this land had already been obtained, and developments would start next year. Presently, Tan controls 66.62% of Dijaya. He directly owns 30.5%, and indirectly owns 17.86% through Impeccable Ace Sdn Bhd and 18.26% through Golden Diversity Sdn Bhd. Upon completion of this exercise, Dijaya will have a landbank of 913 acres in the Klang Valley, Johor, Penang and Sabah with an estimated GDV of RM38bil to bedeveloped over the next 10 to 15 years. Under the exercise, the acquisition of the properties will be satisfied by RM250mil cash and the balance via the issuance of a 10-year 3% coupon Dijaya redeemable convertible unsecured loan stocks (RCULS), with a staggered conversion price range of RM1.30 to RM2.50 over a 10-year period. Dijaya will also undertake an equity fund raising exercise via a renounceable rights issue of up to 491.3mil new shares of RM1 each in Dijaya at an issue price of RM1.20 per rights share, together with a bonus issue of up to 122.83 million new Dijaya shares, on the basis of four rights shares for every five existing Dijaya shares held, and one bonus share for every four rights shares subscribed. KUALA LUMPUR: Dijaya Corp Bhd’s proposed amalgamation exercise, upon its completion by the fourth quarter of this year, will see the group having a landbank of 365.2ha with an estimated gross development value of RM38 billion. In a filing to Bursa Malaysia yesterday, the company said these landbanks in the Klang Valley, Johor, Penang and Sabah will be developed over the next 10 to 15 years. The lettable areas of investment properties will increase to about 1.4 million sq ft from the current 550,000 sq ft and it will generate a more stable and recurring income for the group. The Securities Commission (SC) has initiated a probe into the trading of Eastern & Oriental Holdings Bhd (E&O) and Sime Darby Bhd shares after a news portal reported yesterday that the latter must make a general offer (GO) for E&O shares, which the regulator later denied. 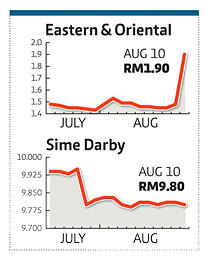 Both counters were among the most active, with E&O surging 28.38 per cent in late trading yesterday to close as top gainer at RM1.90, while Sime Darby shares shed one sen to RM9.80. Prices of E&O-CA warrant jumped a massive 3,200 per cent to close at 16.5 sen from half a sen. The SC said in a statement late yesterday it had begun an "examination of the trading associated with the relevant counters arising from the rumour". The news portal quoting unnamed government sources had reported that the SC had taken a new position on the issue following a review by the the commission under its new chairman, Datuk Ranjit Ajit Singh. "The SC has reviewed the matter and decided to overturn the earlier decision made when Tan Sri Zarinah Anwar was the chairman," the portal reported. However, the SC later issued a statement announcing that its position on the GO requirement remained unchanged as per its statement issued on October 11 last year. "The decision is now subject to judicial review, which is pending in court," the SC said. On October 11 last year, the SC said a mandatory GO would not be required in the circumstances surrounding Sime Darby's acquisition of a 30 per cent stake in E&O. The SC had said it had made the decision after having analysed all the evidence gathered and on findings that the share acquisition had not given rise to a mandatory offer obligation under the Malaysian Code on Takeovers and Mergers 2010. The review by the SC back then had included an assessment of possible concert party relationships between and among the parties involved. Precedents in Malaysia and practices and rulings in other jurisdictions on similar issues were also examined. Bursa Malaysia Securities Bhd also queried E&O yesterday on the unusual market activity, to which the company promptly replied. "After making due enquiry of our directors and major stockholders, the board of directors of the company wishes to inform that there is no corporate development relating to our group's business and affairs that has not been previously announced that may account for such unusual market activity," it said. The V3 viaduct construction package for the Klang Valley MyRapid Transit (KVMRT) project has been awarded to Mudajaya Corporation Bhd. Work is expected to begin this month. The RM816mil package includes three aboveground stations, slope works, sedimentation control, environmental monitoring and compliance management as well as landscape work. This was announced in a press conference yesterday by MRT Corp chief executive officer Datuk Azhar Abdul Hamid. The three stations along the 6km stretch are The Curve, 1Utama and TTDI, using 114 single and cantilever piers. Mudajaya Corporation managing director and chief executive officer Anto Joseph said the expected date of completion for V3 was Feb 29, 2016. “Piling and pier works will take place in stages. Picking up from Dataran Sunway, works to link to The Curve will start in September and completed in November next year. “The second stage — linking The Curve to 1Utama — will commence from May 2013 to October 2013 while works on the link from 1Utama to TTDI will take place this month till November 2014. “Lastly, works from TTDI to Section 17 will only start in July next year and end in November 2014,” he said, adding that pre-works and utility works were taking place now until April 2015. Azhar said they would work at minimising public disturbance and traffic diversions. He added that any notice of temporary disruption to utility services would be announced in the media. Meanwhile, MRT Corp stated that it would be investing in landscape works and sound barriers to minimise the impact of the KVMRT project in Pinggir Zaaba. Azhar also said they were waiting for a reply from the management in BB Plaza and Yayasan Selangor over the integration plan with the Bukit Bintang underground station. 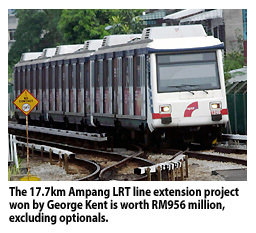 KUALA LUMPUR: George Kent (Malaysia) Bhd has again defended its ability to handle a nearly RM1 billion job for the Ampang LRT line extension project (Ampang LEP). George Kent reiterated that it has a good track record managing construction projects involving complex mechanical and engineering requirements in Malaysia and overseas. Its executive director Dr Cheong Thiam Fook pointed to the construction and design of the new RM100 million Kuala Lipis Hospital and the soon-to-be-completed RM318 million inter-state Semantan raw water transfer project. Cheong noted that despite some comments questioning the company's financial capability and technical expertise, it would still lead the project management team. "We are not amused by comments questioning our financial capability and technical expertise," he said in a statement yesterday. "George Kent will lead the project management team and work with local partners with the required expertise and international best-in-class technical partners for the highly technical and specialised work." The Ampang LEP base contract, worth RM956 million, entails the engineering, procurement, construction, testing and commissioning of the signalling system, communication, track work and third rail, the electrification of the rail system and other associated works for the 17.7km extension connecting the Sri Petaling station to Putra Heights. The base contract sum, together with the optionals of RM128.62 million, was well within the initial tender price with absolutely no additions, post the close of tender, said Cheong. George Kent had started preliminary work on the LRT extension project, he added. This includes negotiations with specialist contractors to take on certain highly technical and specialised work for the line. George Kent's focus now is to form partnerships with reputable technology partners to ensure smooth and cost-effective construction. Cheong said such a partnership would ensure a significant technology transfer to local contractors. "The project management team will have 70 per cent Malaysian participation and George Kent will be leading the project team with Germany-based Tewet Gmbh, a highly respected and internationally recognised project technical consultant with experience in more than 400 similar projects completed around the globe," he added. Tewet was also the consultant to the Bursa Line in Turkey, which has a scope of work similar to what is required in the Ampang LEP.